Many fast-food restaurants serve breakfast burritos, with eggs and bacon wrapped up in a soft flour tortilla, with maybe some chiles or hot sauce added. They are warm, bland, and satisfying. Breakfast tacos start the day with a fresh hot buzz, and can be made very quickly on mornings when kids are hustling to get ready for school and you feel like you are running late. You know that feeling. Preheat a skillet on medium heat with a few drops of water in it. When the water boils, it’s hot enough. If you are using a non-stick skillet, melt a pat of butter and spread it around. If your skillet is metal, pour a teaspoon or two of corn or peanut oil, and spread it around. Put a corn tortilla in the skillet, and fry it on medium heat for a minute or two. Flip and fry on the other side. Repeat steps 4 and 5 with the second tortilla. Put the second tortilla on the plate, overlapping the first tortilla, so that you can put egg on it properly. Scramble the egg, milk, salt, and pepper. Add a tiny bit more butter or oil to the pan to cook the egg. Pour in egg, and stir. Turn off the heat and let the residual heat cook the egg while you stir it. 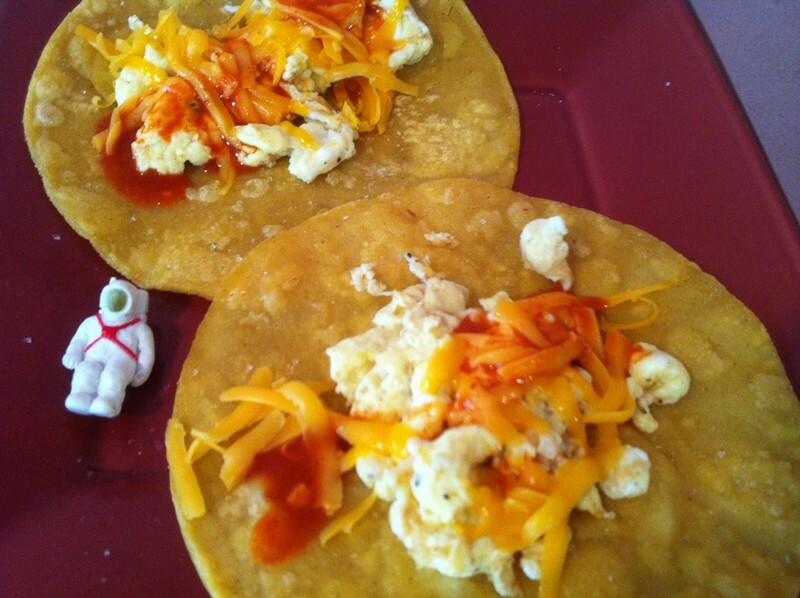 Divide the scrambled egg evenly onto the two tortillas. Add cheese, hot sauce, and more salt and pepper if you wish. Fold them and eat them.